This is rank speculation built on a foundation of conjecture, but, the more I think about it, the more I think that there is a decent case to be made for Tebow to go pro now rather than come back for his senior year. First, I have no idea what kind of pro player Tebow will make. He's obviously one of the best and most accomplished college players in recent history. But what would he gain exactly by coming back, comparing to what he might gain (or lose) by leaving early? By coming back he could win the Heisman (he has one), a National Championship (he has two), or he could just "enjoy the college experience." Though I imagine if Tebow says that he'll have something different in mind than Matt Leinart did when he offered that reason. (Leinart took a single music class his senior year, but presumably kept an otherwise busy schedule.) Tebow also might be able to improve his draft stock by improving his footwork and decision-making skills. But why not just work on those things in the pros? It's unlikely that Tebow would be able to suddenly vault into being a first or even second rounder next year, particularly since Florida is not exactly going to change the gameplan. And if he wants to work on things like his footwork, reads, and learning the contours of an NFL offense, why not do it in the NFL? Many of the current starting quarterbacks all had significant apprentice time on a roster, and I think we all expect Tebow to work rather diligently at improving once he is there. And he does have some physical tools. I mean, he could hire some quarterback gurus and tutors for the offseason (he would be doing that anyway), but once in the NFL he would be able to work for a couple of years on nothing but the things that might make him a successful NFL QB. Another factor is his mediocre draft grade. Although at first blush this seems like a disadvantage, my guess is that that whoever actually does draft him will do so because they see potential in him. They probably too will know a thing or two about developing quarterbacks. (Maybe Urban's good buddy Bill Belichick will take a flyer on the kid? Worked for Matt Cassel.) So he might land in a great situation where he'd be able to work on his game and develop. The biggest possible disadvantage I'd see for Tebow is that, if he is only projected to be a fourth through sixth rounder this year, by leaving he might lose an opportunity to leap into the second or third round next year where he'd make significantly more money. But something tells me that is not the sort of thing driving him. And in any event, that's a speculative reason; his draft grade could also remain the same. Finally, one factor plays a part with Tebow that normally wouldn't with other quarterbacks, but often does with runningbacks: hits and shelf life. NFL runningbacks have a limited shelf-life, before their skills and ability quickly diminish. The common wisdom is that this is a factor of the hits and punishment their bodies take. Tebow, unlike most future pro quarterbacks, takes many hits like a runningback; indeed, he often delivers them. It's a crude measure, but compare the total carries by Tebow to Texas Tech's quarterback, Graham Harrell, over the last two seasons. (In college "carries" includes sacks.) In 2007 and 2008, Harrell had 79 total "carries." Tebow? 386. Adding another 200 carries, sacks, and other hits might just start to wear on his body. And we all know NFL guys will be trying to hit him hard and often when he gets there, so body preservation might be reason alone. So there it is. I'd bet that he comes back, but it's worth considering some reasons why he might not. The biggest is to get in the right situation with the right coaches. I mean, this afternoon we have Jake Delhomme playing against Kurt Warner, two guys who made their careers by beginning as backups and developing once they were in the league (or in the Arena league or NFL Europe). Leinart? He's on the bench. Update: Well, Tebow is coming back. One important factor: Scot Loeffler. Loeffler has been hired by Urban Meyer as the Gators' quarterbacks coach, and his track record (Tom Brady's senior year, John Navarre's ridiculous improvement from a high school defensive end to an NFL draft pick, Chad Henne) of getting quarterbacks into the league is certainly a drawing factor. 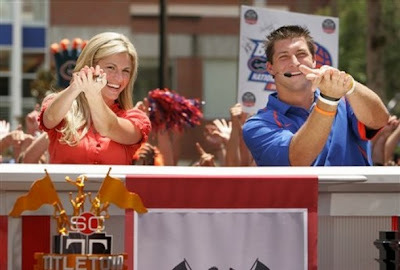 Tebow and his family loved Loeffler when he was at Michigan during Tim's recruiting process, but Florida had much more to offer at the time than did Michigan. Loeffler was one great piece of a package, and though Florida may not have had a QB coach the Tebows respected as much, the total package in Gainesville was too much to pass up. I'd be surprised if Loeffler's hiring by Urban Meyer wasn't, in part, a way to keep Tebow in school for one more year (of course, he's also a damn good coach in his own right). One important thing about Loeffler is that he is a strict pro-style coach. In fact, he has made some not-so-complimentary comments about the spread in the past. Perhaps Loeffler is a one-year fix for Florida to A) Keep Tebow in the college one more year, and B) Prepare Tebow for the NFL. It may be something of a wild theory, but I'd be surprised if there wasn't a little something to it. I'm be shocked if someone didn't use at worst a third round pick on him. He is nothing if not a consummate professional, and loves to prove his doubters wrong. And Kurt Warner beat the Panthers on a simple Levels play to Fitzgerald the entire first half. 2. Ability to read coverage, keys, progressions, etc. to determine where to throw. This is why Chad Pennington is a better QB than Vince Young or Michael Vick, even when Chad's arm is hurt. Tebow will succeed in the NFL to the extent he is accurate enough and smart enough. He has far more than sufficient arm strength. He's tough and he's a leader which are nice pluses. My curiousity is how much of his passing success at Florida is due to the dominant athletes he has on offense. Can he consistently squeeze in the tight throws when his receivers are not wide open? You must not have seen the SEC championship game this year. Tebow made several throws in the second half that cannot be described as anything but perfect. As an Alabama fan, I'm not too thrilled about what he did, so you can rest assured that I'm not exaggerating. Tebow could go pro in an early round simply based on the consistent failure of the NFL to produce good draft decisions. Thus this is a relatively silly topic unless one first addresses a proven method of selecting future NFL in the draft that points to Tebow as viable NFL talent. I think Leinart stayed because he knew he wasn't good enough and Tebow stayed because he knows he would take bigger hits on his way to developing as a pro passer. On this topic I find myself agreeing with Mel Kiper of ESPN (crazy, I know). Tebow will be a successful tight end or H-back, but NFL QB still does not suit someone of his skillset (see Vince Young and Michael Vick). Though it may in the near future with the popularity, but marginal success of "Wildcat" sets. But look for Tebow's usefullness and shelf life to be cut considerably when the top 3% of all college players line up across from him in the NFL. The hype (yes, that's what it is) surrounding Tebow and his "accomplishments" flys in the face of smart football. He won a Heisman as the best college football player when there was no one to compare to the situations he was put in. Looking at his accomplishments, you have to look at situations and weigh them appropriately. Florida effectively plays with a one man advantage in their offense. I'm not saying that it is unfair or bad football, it simply does not translate to a standardized measure of performance- chalk it up as another reason why college football is a beauty pageant that lies outside the realm of "smart" football in many ways- not by the action on the field, but by the oranganization within which it operates. An aside- Last year was Tebow's year and they did not play for the title. This year, Florida won the championship (debatable- see perfect Utah) on the legs of Percy Harvin. Don't fool yourselves, UM did not hire this guy so he could tinker with his offense. If you remember correctly, the first few games of this year looked like they were trying to do that to Tim and it killed us. UM will not do that again. This coach will help him with footwork and decision making, but Tebow is a very accurate QB with Good strength. He makes good decisions and he is a great leader. Some one like Bill Bilichick will snap him up and use him the right way, He may use him out of shotgun forever or he may be like all the other Gator qb's in the NFL and be a solid backup. Nothing wrong with that. What if though he is the one guy that can do what Mike Vick or Vince Young could never do and run that type of offense well? Kordell Stewart did an okay job if recall. Doesn't matter now. I can tell you that Tebow will be handled with kid gloves this year and he will work closely with Meyer to keep focus on the spread.